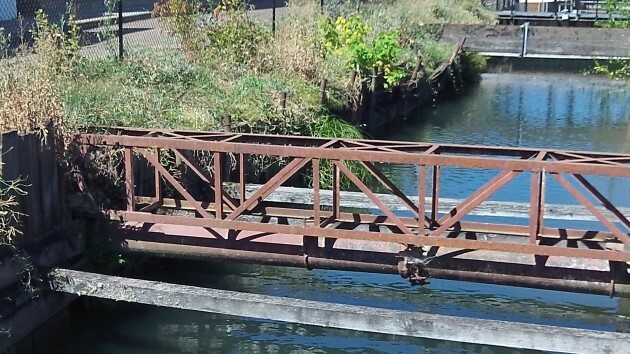 This segment of the Santiam Canal in downtown Albany is in poor shape and needs to be repaired. A boat, they say, is mostly a hole in the water into which to pour money. At times the Santiam Canal must seem like that to the city of Albany. In 2005 and ’06, Albany spent millions upgrading the canal’s head works on the South Santiam River. Since then it has sunk money into repairs the banks and dredging portions of the canal’s 18 miles from the Lebanon Dam to the Vine Street water treatment and hydroelectric plant. It also spent $1.6 million to install a new generator in 2008. Braces keep the banks from caving in. 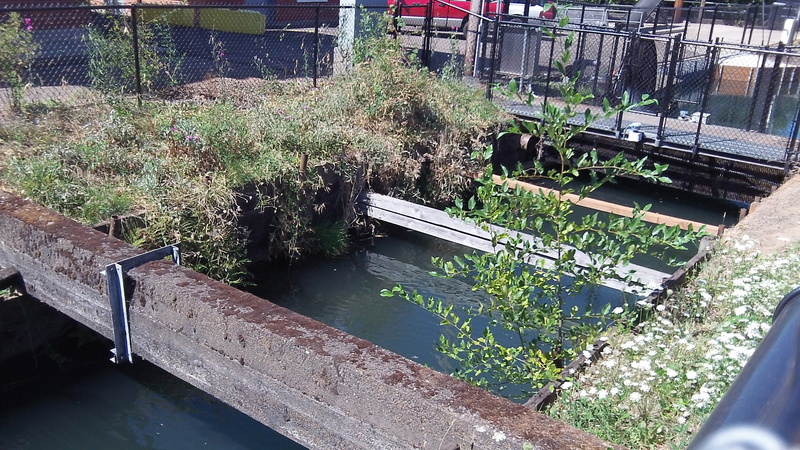 Now the latest chapter: Timbers that keep the banks from falling in on a downtown segment of the canal are failing, and the city has called for bids by Sept. 9 to make repairs. The problem between Third and Fourth Avenues, and repairs are estimated to cost around $170,000. Meanwhile, talks continued last week between Albany and Lebanon on Albany’s attempt to recover from Lebanon some of the costs of the intake work. Albany started out demanding that Lebanon pay half of the dam reconstruction and fish screen and related work at the head of the canal, as well as half of a flow control structure, plus all of a new structure to control flow to a proposed new Lebanon water treatment plant, all of it adding up to $3.8 million. Lebanon offered to pay not 50 percent but 3 percent of the capital costs based on the percentage of the canal flow that it uses. Lebanon reports that Albany has reduced its request to $2.2 million or one-third of the capital costs. As an alternative, Albany proposed that the cities commission an analysis by a third party of the costs Lebanon is avoiding by continuing to draw its water from the canal rather than building a new intake on the Santiam River itself. Albany argues that Lebanon would have to bear all the costs of a new intake and this would make Albany’s cost-sharing proposal seem more attractive to the smaller city. Albany also wants Lebanon to consider what it would have to pay to handle storm runoff if it were not for the canal, which now receives the runoff and carries it to Albany. The city of Albany owns the canal, Pacific Power having unloaded it in the 1980s when the power company got out of the water business. Lebanon has a water right on the South Santiam River, but its legal intake point is on the canal. Lebanon wants to build a new treatment plant, but Albany has refused to allow a new intake until Lebanon agrees to share in the capital costs Albany paid in 2005 and ’06. All of this is overshadowed by the fact that except for the weeks of highest demand in the summer, Albany doesn’t need the canal at all. Almost all of its daily water needs are met from the Scravel Hill plant that Albany built with Millersburg. When the canal head works were rebuilt at a cost of $4.4 million (the amount reported at the time), the most proximate justification was that it was required by the federal license to restart electric generation at the Vine Street plant. The “math” never did add up when installing the generator. Cost to operate it didn’t include wages for the employees Or did the City just have extra people standing around with nothing better to do. They then start the “canal improvements” that you refer to, passing on the cost to anybody that pays a water bill. It makes one wonder how many other “funds” were used under false pretenses. The City needs to use a bit of common sense and tighten its belt like the rest of us have had to do.